New York, NY — As we often note, police officers in America have what is called ‘officer discretion’ as one of their many tools—meaning that if a police officer wants to let you go for a violation he or she thinks didn’t cause any harm, they can do just that. While they can’t make these decisions in cases of murder or other felonies, cops can most assuredly choose to ‘look the other way’ in instances in which mothers are breastfeeding their babies. However, one cop in New York couldn’t have cared less about using his discretion and he cited a mom for doing just that. Guillermina Rodriguez, 30, was in heavy traffic last week when her newborn baby began to cry. She explained that since the traffic was so heavy, she decided to just pull over to the side of the road and park. “I’m like almost crying because she’s crying, and all I want to do is pull over so I can tend to her,” Rodriguez told WABC-TV. Rodriguez said she pulled over on 8th Avenue, between 30th Street and 31st Street, in a no-standing commercial zone, just down the block from Penn Station in midtown, according to PIX11. She then hopped into the backseat and began breastfeeding her three-week-old baby. Just a few moments later, a police officer targeted her for revenue collection. The officer was accompanied by a tow truck driver who was going to take Rodriguez’ car. The breastfeeding mom watched as the cop was preparing to tow her car and honked her horn to alert the officer that she was in the back seat. She then took out her phone and began recording. 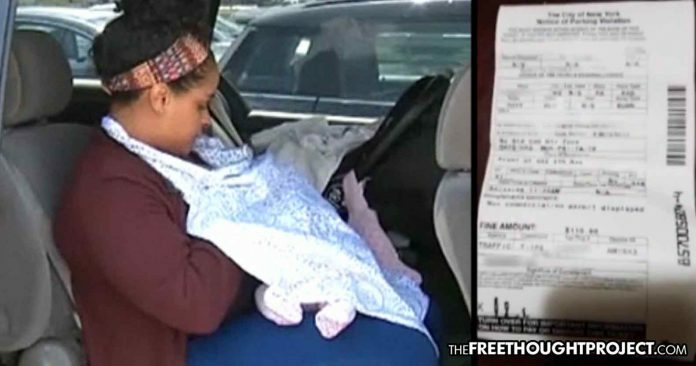 She explained that he continued to write a ticket in spite of seeing her sitting in the car breastfeeding. He then put the ticket on her window and walked away. Rodriguez reported the incident to the breastfeeding advocacy group La Leche League who was quick to decry the officer’s actions. We agree. Sadly, however, this was not the case and now this new mom will have to fight the ticket in court. Hopefully, the judge doesn’t apply the same lack of discretion the police officer did and he dismisses the charge. While this officer couldn’t have cared less about this breastfeeding mother, one cop in Columbia did something incredible and actually breast fed a baby to save her life. The infant was in severe distress as officer Luisa Fernanda Urrea arrived, finding that she was starving and facing hypothermia. Urrea, who had just become a mother herself, began to breastfeed the infant, not only providing sustenance but saving the baby’s life in the process. The New York police department could definitely use a role model like Urrea.